I still can’t manage to wrap my head around the fact that I’m 30. Three-zero. Thirty. As in the age my mom was when she had me. As in it’s now sad if I’m irresponsible and not vaguely charming. As in sophomore year of high school was half my lifetime ago. As in there are kids with learner’s permits who were born the year I got mine. It’s frightening, in a way, or at the very least arresting. That’s not to say that I’m unhappy with my life or would prefer the alternative to getting older (30 trumps dead every time), it’s just a little bizarre to say it out loud or stop to think about it. But the celebrating? Oh my how it rocks. Two weekends ago The Man whisked me off to a quiet mountain retreat near Yosemite. We hiked (and I got to wave at the source of my water in the city), napped, wandered, and breathed. He taught me to play pool, befriended the staff, and stuck his head under a waterfall. I drank my lunch, ate ice cream in bed, and got chased by a bee. We both arrived sick and left healthy, a testament to the curative properties of fresh air, mountain well water, and time spent contemplating the moon. 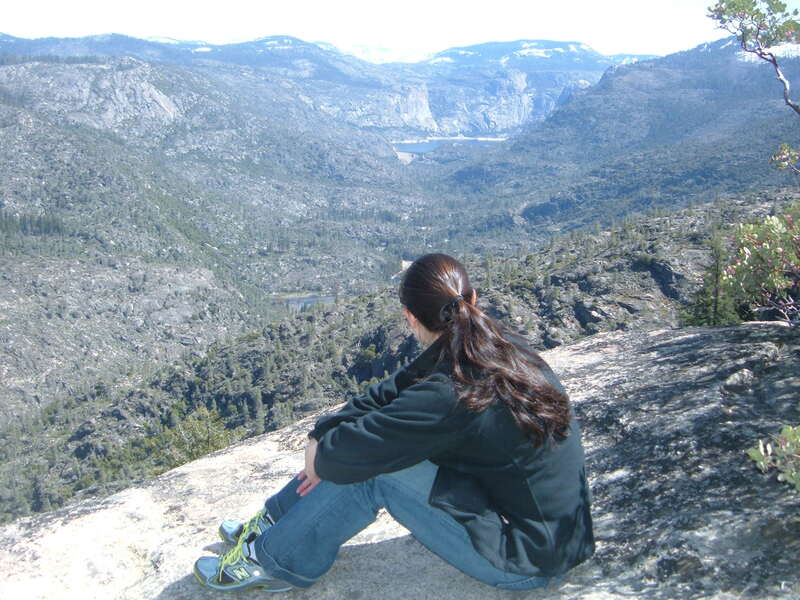 Here I am looking out over Hetch Hetchy Valley during my perfect weekend. 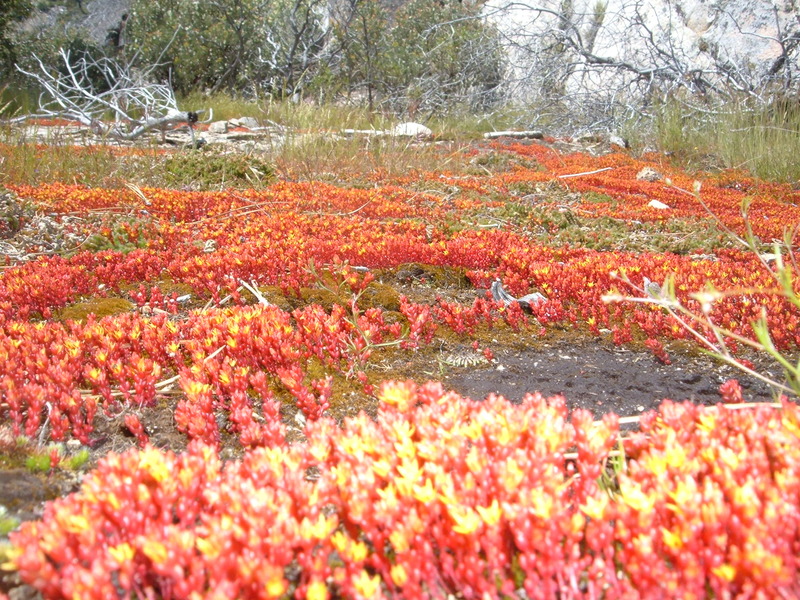 The Man indulged my obsession with these little red and yellow flowers that grew out of the moss. The bee guarding them was the size of my fist (or so it seemed at the time), black and fat with the satisfaction of stinging city girls, so I ran walked calmly away while The Man kindly snapped photos. I still wake up expecting a 10 am wine tasting. And crave a nice crisp half glass of sauvignon blanc or viognier. Sometimes the things you’ve been planning for years feel anti-climactic in the moment, but not this one. Future CEO’s fabulous family and my fabulous parents and our fabulous friends made for the perfect, insanely indulgent weekend of wine, walks, food, and fire. Most of those pictures ended up on some other camera (and may not be suitable for sharing), but it was a damn good time. One I’ll certainly remember for the next thirty years. On Friday after work, I’ll head to Monterey where I’m meeting The Man for an unofficial Celebration #3. I leave Wednesday for Celebration #4 in Boston (plus wedding #2!) and then that’s it. Sometime in late-May I’ll begin acting my age, I promise. I’m (probably) listening to something from my Coke, Armani, and Richard Gere playlist*. Like Metric’s “Gimme Sympathy” or Annie Lennox’s “Walking on Broken Glass”. I’m (probably) reading The Windup Girl, the May book club selection. I’m (probably) craving Terra’s Wurtele Cab. I’m (probably) coveting a fun little clutch/cross-body bag that would leave my hands free for a wine glass! Happy Weekend Everyone! See you on the other side of 30! *This comes from a segment or interview I saw years ago that talked about fashion in film or perhaps Mr. Armani’s influence on American men’s attire. What I remember distinctly is the discussion of how Gere’s character takes pleasure in getting dressed for an evening, taking his time and doing a bit of coke to enhance the experience. For me, since I don’t own Armani and don’t do coke, this is the mix that accompanies a glass of bourbon or a flute of bubbly and long, thoughtful, Saturday night gazes into my closet. As that big birthday approaches, I’m trying not to think about what I wanted to accomplish by that lovely round-numbered age. So instead, let’s think about all of the things I shouldn’t do before I turn 30 in four months. 1. Develop a meth habit. Just messy. 2. Sleep with Tiger Woods. Just dirty. 3. Date Chris Brown. Just dangerous. 4. Marry Heather Mills. Just crazy. 5. Faint three times during my birthday week. Just been there, done that. 7. Fall down an elevator shaft. Just bloody unlikely. 8. Compete in any Miss Universe-associated pageant. Just sleazy. 9. Pretend to like LL Cool J for his mind. Just not believable. 10. Get pregnant. Just not interested yet. 11. Visit the slums of Calcutta. Just depressing. 12. Join the US Army. Just not sure I can pull of that shade of green. 13. Spend a night in jail. Just not that into handcuffs. Ahem. 14. Camp alone. Just too afraid of deer. 15. Become a Yankees fan. Just not happening. 16. Wear Crocs. Just say no. 17. Date another 24-26 year old boy. Just prefer men. 18. Perform Backstreet Boys at bachelorette party karaoke. Just a “Livin’ on a Prayer” girl. 19. Move away from San Francisco. Just still in love with my city. 20. Drink a 30-year-old bottle of Caymus. Just kidding, I’ll totally do that. *And by “wine cellar” I mean the completely packed extra fridge in the garage and the wine chiller that holds the really good stuff. Dancing Roommate and I went to a favorite bar last night for a drink. Despite bone-deep fatigue and my own certainty that I’d regret the outing when my alarm went off at 6 am, I was having a good time. DR chatted with a slightly slow Tom Hanks-type and I made friends with the 6’7″ manboy to my left. I can’t say I was interested, but he seemed to be checking his Blackberry in a way that made it obvious he was uncomfortable at a bar alone. We sat, we chatted, Tom Hanks bought us a second round. The manboy proceeded to get drunk. Somewhere after his fifth beer (sixth? seventh?) he began to joke with the bartender and other patrons. Suddenly he busted out a “Don’t be Jewish about it, man” to someone, somewhere. Now I grew up where this is typical. My high school boyfriend AND my high school best friend required some teaching to correct their ignorance, but in a stranger? I don’t handle it very well. That many beers in, I doubt manboy felt the icy chill coming from my direction (which only intensified when he proceeded to make fun of a British woman a few stools down for having “English teeth” — complete with a chipmunk-face immitation), but I didn’t see any reason to either address it or continue my conversation with him. An hour later we were ready to leave and I called over the man behind the bar. “I never paid for my first beer,” I said. Because preying on a bartender’s distraction is stealing. “You’re so honest!” manboy interjected with a tone of incredulity. “Well, it’s how I was raised,” I replied. Lately I’ve been about the present. About the silhouette of a tree and the soft patter of bare feet. About the five distinct smells on the walk from Peet’s to my office. Lately I’ve been about putting down the iPhone and turning off the television. Lately I’ve been about the real and the possible. About the polite stranger who offered his bar stool and the kind neighbor who saw I needed a hug. Not about the handsome Southerner who is a walking contradiction in a thousand perfect ways. Lately I’ve been about time outside breathing and exploring and moving. Lately I’ve been about family. About those related by blood and those I’ve chosen. About making sure it doesn’t take a funeral to gather us all in one city. Lately I’ve been about showing people who I am, unapologetically and relentlessly. Lately I’ve been about acting my age (but not looking it). Lately I’ve been about choosing my tempo. About eating, dancing, running, thinking, deciding, talking, cleaning, planning, and changing at my pace. Lately I’ve developed a raging crush on Neil Patrick Harris. OK, so it’s 11:42 on Wednesday and I’ve had three glasses of wine, gone to the ballet, and determined that my book club needs an annual trip to Vegas. I’ll wake up in four and a half hours, take a quick shower, and board a plane for Germany with my disturbingly-chipper-in-the-morning mother. (I’ve also agreed to review one more contract while waiting for my plane – yes, I’m an idiot.) And then I’m off the grid until the 21st. So be well, perform random acts of kindness, wear cute shoes, and we’ll chat again in two weeks. Once again my parents are in town (sort of) and once again we celebrated my parents’ anniversary (sort of) and once again my dad went all nutso with the booze ordering and had to drive my car for me. It was a table of my dad’s co-workers, my mother, and me. It was a restaurant with two Michelin stars, a tasting menu, and a book for a wine list. Now I may be a sucker for a tasting menu, but Dad’s a sucker for a sommelier who loves California as much as France. It was the wine pairing for every course that did me in. DID. ME. IN. You have to train to drink like that. Somewhere around the cheese course I realized that my dad was toasting me. Oh holy hell. So here’s your Friday Four, which I promise took more effort than it seems. I’m reading Saturday by Ian McEwan. Somewhere in my unpacking I found two copies and had never read either one. He needs to stop talking about brain surgery soon or I’m putting it right back down. I will puke on you Ian McEwan, I will. I’ll hunt you down and puke on you. Or, you know, I’ll just stop reading your book. I’m craving Top Ramen. Don’t look at me like that, I’m hungover. I’m coveting a place to eat my Top Ramen and watch bad cable. Did I mention I’m hungover?